In Istanbul's Unkapani quarter there is a small, insignificant music shop. In its window you'll find a lot of guitars and Turkish percussion instruments. Above the shop there are huge letters spreading the name "Cümbüş." If you enter, you might be lucky enough to have Fethi Abidin Cümbüş give you a warm welcome. "The name Cümbüş is our pride and tradition." Together with his brother Abidin Alihan he represents the fourth generation of a family wearing the name of an instrument, which Ry Cooder, "Värtinnä" from Finland, and Turkish Gypsies enjoy playing. The family originally came from Üsküp in Macedonia, where Fethi's greatgrandfather was born in a family of weapon traders and makers. Zeynel Abidin's grandfather was a sword-maker and his father a gunsmith. From Macedonia they moved to Istanbul, shortly before World War I broke out, which caused a radical change for Zeynel Abidin. In 1915 he took part in the Canakkali battle, a bloody batte in which Turks and Germans fought against troops from England, New Zealand and Australia. When Zeynel Abidin later came back to Izmir, he said, "This war made me very, very sad. I will not maintain a family tradition of producing or trading weapons any more." But this was easier said than done. He tried to trade in musical instruments and it took some time to succeed in this business. In 1922 he opened the first music store in Istanbul's quarter of Besiktas. He imported double basses and violins from Germany and Czechoslovakia. Four years later he moved to Izmir to open a shop, just to leave it for his two sons and to return to Istanbul to open another music store in Beyazit. (The shop in Izmir was closed in 1938.) Zeynel Abidin and his two sons finally settled down in Istanbul to run the shop and later to open a manufacturing company. But before this, something else had to happen. Although Zeynel Abidin was not an educated musician, and was working as a musical salesman, his first love was inventing musical instruments. He constructed a new kind of Arabic lute, but his oud did not have the typical round belly but the flat one of a guitar. For kids he built a violin which grew with additional elements as the child grew. Most of his inventions remained simple drawings, for some he built prototypes, or filed patents without following up. His creativity made him well prepared for social change: the founding of the Turkish republic in 1923 nurtured an atmosphere for new inventions, as the president Mustafa Kemal Atatürk spread the ideology of a new and modern Turkey. For many centuries the Turks themselves were not deeply engaged in trade and business. They were rulers and warriors, and had built one of the great empires, while Jews, Middle-Europeans, Armenians and others kept running the businesses. After the decline of the Ottoman Empire the Turks needed to become aware of and develop a wide range of capabilities. The ideas of Atatürk impressed the inventor Zeynel Abidin, who was already ahead of his time. On the 14th of January, 1930, the great moment for Zeynel Abidin had come when he met Mustafa Kemal Atatürk at a dinner. The president underlined that this country badly needs innovation and inventions, new impulses. Zeynel Abidin had already built a brand new instrument. It was his third or fourth one, but this was his pride and joy: it was fretless and had the neck and tuning similar to the Arabic lute oud, but had 12 strings (6 courses of 2 each) instead of 11 strings and a round corpus made of aluminium. This and the leather soundboard was similar to the American banjo, although its body had not the form of a frame-drum but of a small Turkish kesselpauke. Ten days later Atatürk held this instrument in his hands; a typical mix between East and West, expressing the role of Turkey and Atatürks view of Turkey on its way from tradition to modern times. Within the same year this instrument was registered at the patent office under the number 868 as Cümbüş - metallic automatic lute." It was called "automatic" because it had mechanical tuners for the strings, which were unusual in Turkey of that time. The instrument was lacking a name and the solution was really remarkable, as Fethi Abidin Cümbüş describes: "Atatürk listened to the instrument and he said: 'Wherever it may appear, it will spread fun. So the name of this instrument will be 'Funny.'" Atatürk's name-giving made Zeynel Abidin so proud that he not only gave this name to his instrument, but to his whole family. This instrument was 'state of the art' for its time. It was ready-to-go, as it had a removable neck so that you could easily put it in a package and send it by post all over Anatolia or the rest of the world. Another revolutionary idea was to take different sized necks for only one body. Within a minute you can turn the standard oud-type into a long neck lute or a mandoline, just by changing the neck. The cümbüs also incorporated many aspects of a new concept for Turkey, which the godfather-like Atatürk had in mind. Beside modern east-west technology, it also realised the emancipation of woman, which is measurable in the design: the female cümbüş was a bit shorter than the standart model, as much as 15% of all customers at that time were women. But this is history, just like many other plans and ideas of Atatürk, turned out to be far from the social and spiritual reality of Turkey. The female cümbüş is long gone and researchers are excited nowadays if they find women in the countryside who play an instrument of any kind. In the 40's and 50's the cümbüş became very successful, even accompanying the stars of the Turkish night clubs. (Listen: Beyoglu) But Zeynel Abidin Cümbüş was heading for more, as he gained a wider acceptance for his instrument. Only one year after the invention he received a certificate from the leader of the president's orchestra, documenting that "this instrument is able to repeat the sound of eastern and western instruments alike, to sound like mandolin, guitar, banjo, tambur and oud by changing the neck." In 1931 he wrote a book about his instrument and three years later he gave one instrument to the Shah of Persia. Turkish Gypsies were open for useful innovations: they introduced European instruments like trumpets, clarinet, violin and accordeon and the cümbüş was quite right for their musical practice. Up to the present day the Gypsies are very thankful for this prescious invention that supported a profession, which still is one of the best a Gypsy can get in today's Turkey to earn his living: a musician. Fethi Cümbüş knows this from his own experience. "Many Gypsies still enter our shop and say 'Thanks' to Zeynel Abidin for this wonderful instrument." It was the Gypsies who spread this instrument to countries like Greece and Macedonia (where the Cümbüş family originally came from). But the popularity of the cümbüş has vanished. In the 60's there was a great cultural pressure on this instrument; a strong Arabian influence from Beirut (which was at that time the 'Paris of the East') overtook Turkey. Arabic films filled the cinemas and the nearly forgotten oud had an unexpected comeback, which was made possible by technical developments; amplifiers and loudspeakers intensified the oud at concerts and the cümbüş lost some of its advantage. The former high-tech instrument and urban child of a modern Turkey became an indicator of "old-fashioned-ness." It still survived in the countryside, where modern PA- systems hadn't yet found their way, but its urban decline led the company into economical difficulties. In an effort to expand the instrument's value, the Cümbüş family widened the range of their productions, while continuing to manufacture instruments made of practical, light aluminium, including an aluminum bodied darbukka (hand drums originally made of clay). But their pride and joy seemed to be fading away. 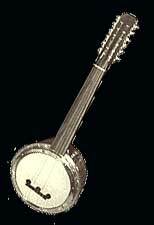 In the 1950's and 60's an export from the United States became very popular: the 5-string-banjo. The Kingston Trio was an ideal for the "Modern Folk Üclüsü" and these "modern folk trios" became so popular that they even performed in football stadiums with their guitars, banjos and harmony singing, in front of enthusiastic audiences looking for the madness and joy of other modern fads like Beatlemania. So in Turkey at the end of the 60's cümbüş was out and banjo was in. But in 1967, more than 10,000 miles further west, there was a very different situation. After he had won several American banjo competitions, the young David Lindley, a founding member of the cult band Kaleidoscope bought his first cümbüsh for $60.00 at "Akron," a shop in California that specialized on all kinds of strange, imported instruments and played it with the band, especially at studio sessions. Here the second life of the cümbüsh began, as an amazing side step for "world musicians." Up to the present day the cümbüsh has remained an important part of David Lindley's huge instrumental collection. He played it with Ry Cooder in the sound-track of "Paris-Texas" using a banjo-picking-style or producing a cello-like-sound by bowing the long necked Yayli Tambur cümbüş. A few years ago he transformed Bob Dylan's "Well Well Well" on such a cümbüsh, introducing the sound as "a kind of Black & Decker-effect, like a chain-saw." (Listen). Today the cümbüsh is heard in the contemporary compositions of the Austrian composer Karlheinz Essel, played by Jack Hauser. Khaled and Radio Tarifa enjoy this instrument, as well as Yat Kha from Tuva. There is another musician who has integrated the cümbüs more than anyone else in a modern concept of music: the US-Armenian Ara Dinkjian, who plays it (as well as the oud) in his group Night Ark. He found this instrument by pure coincidence. "The first time I was aware of the cümbüş a friend of a family, whose husband has passed away, was selling off some of the instruments that he had collected. So I bought it and that was my first contact with it. I really didn't know what it was." Cover versions of his compositions for Night Ark like "Pictures" and "Homecomings" became popular in countries like Israel, Macedonia and Russia, and even number-one-hits in the Greek and Turkish charts. Ara Dinkjian brought the cümbüş back to Turkey or, at least let's say, got some credit for an underdog instrument. This may be surprising for an Armenian in Turkey after their bloody history, but this also puts a spotlight on another aspect of a multicultural Turkey, which he is following in its very own, contemporary way. He says, "The Armenians have always been pioneers and a critical part of the Turkish music. So I am just sort of continuing, just doing my little part and I take the cümbüş as another sound in my palette of musical instruments. I am an Armenian American and I just utilize these sounds to express myself. " Ara's photo hangs on the wall of the cümbüş store in Istanbul-Unkapani. Nowadays the cümbüş has three different sized bodies and 6 different necks. It can be used as an oud. With a 1.2 meter neck it becomes a tambur of the classical Turkish music, where it can also played with a bow, so it is called "yayli tambur." With a little shorter neck it turns into the famous saz-cümbüş and with an even shorter neck to the small lute cura-cümbüş. For a western audience they offer the fretted twelve-string guitar-cümbüş and finally the mandolin-cümbüş. In spite of that diversification, the cümbüş today is of less economic importance. Only 3,000 pieces a year leave the family's factory in Istanbul, run by Naci Abidin Cümbüş and his two sons Fethi and Alizeynel. The instruments are still hand made and sold for a surprisingly low price, as it was meant to be the people's instrument. Half of the production goes abroad, mostly to the United States, some to France and to Greece, mostly to supply open-minded musicians heading for unique sounds and new playgrounds. The other half still supports the traditional use of the cümbüş. The company also manufactures between 5,000 and 7,000 Darbukkas a year and even in their small shop they sell 5,000 guitars. But cümbüş is still the soul and the musical masterpiece of the house, which not only gave them their name and pride, but also gives a lot of cümbüş/fun to many musicians and their audiences. All text is copyright 2002 RootsWorld and Birger Gesthuisen. No use of this text in whole or in part may be made without written permsission.